In the women's A race (and European 10k championship race) , Israel’s Lonah Chemtai Salpeter won in 31:33.03, the fastest time in the world so far this year. Romanian Ancuta Bobocel (31:43.12) came second, wtih Charlotte Arter of GB taking Bronze (32:15.71). That times gets Charlotte well inside the European Championships standard of 32:30 so she'll be automatically offered a place in the GB team. AW notes that "Six other UK athletes came within 10 seconds of the qualifying time for Berlin with far faster second halves but couldn’t make up for the slow starts"
Faye Fullerton - 28th in 33:47.70. 6th - Shona Heaslip of Ireland in 33:24.00. 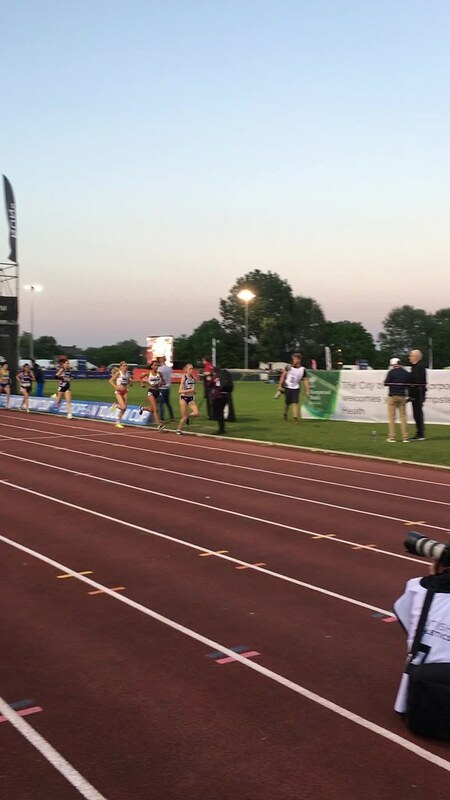 1st GB and 10th in the race was Nicole Taylor (Tonbridge) (Twitter @Nicole_taylor7)in a PB 33:53.44. Lucy Reid (Tonbridge) (Twitter) was 11th in 33:58.73. And then of course there was the Strava Pursuit mile where Hannah England chased other professional athletes around the track for a mile after giving them a 45s lead. There's been loads written about this event so I'll send you in the direction of other people who have done a better job than I ever could, but safe to say, this event is FANTASTIC. It's family and non-running-geek friendly but also a super high standard, so rewarding for those real running fanatics. Really, go next year if you didn't last year. Carly Needham of Rochdale Harriers & AC won in 1:19:28. With has a PB of 1:18:04 which was set a while ago in 2010 at the BUPA Great North Run, she’s been back in form this year and was was recently crowned the 2018 Women’s Greater Manchester Cross Country Champion. Carly finished way ahead of runner up Luljeta Shala from Podujeva, Kosovo (Llapi Athletics Club) who finished in 1:24:16 (PB 1:21:52). Luljeta carries on the link between Kosovo and Manchester running events, which was a started as a result of work by organisation Manchester Aid to Kosovo and saw her break the Kosovo 10k record in last year’s event. Third place went to Helen Ibbotson in 1:25:13 who is having a storming start to 2018 as she built on recent performances at the Paris Marathon (3:02:52) and Fitbit Semi de Pari (1:25:25) where she had already set PB’s in both events in March and April. England Athletics have finally announced the London Marathon Team results. It seems to take ages to confirm these results, I guess because the vests and first claim status etc all have to be double and tripple checked becuase there's a financial implication on the results. London Heathside have been confirmed as the winner of the Women's team in a combined time of 9:03:29 which considering they didn't even feature last year is mighty impressive. Clapham Chasers moved up from 6th last year into second this year, improving their combined time by 2mins 17 seconds. Rugby & Northampton took third, again not having feature in last year's results. You can see the full see 2017 results here and 2018 here. 1st Stephanie Davis (Strava ) 1:16:38 (21st OA) of Clapham Chasers. She doesn’t have an official Half marathon PB on Run Britain / Power of 10 but her Strava says it’s a PB, so well done! 3rd Emily 'Pronto' [sic] 1:21:34 (82 OA) of Arena 80 - Should be Emily Proto ( Insta ) - she has a HM PB of 1:18 . I love Emily's honest on Insta and I also love just how much she loves racing! 4th, 5th, 6th, 7th, 8th and 9th are noted as ‘unknown runner’, and I didn't get down further than that so it may continue. It seems to only affect female runners which is odd. Get better please, Virgin Sport Results people. The course record of 7:11:00 was set by Holly Rush in 2016. 50 miles and 1700m elevation with a 13 hr cut off. It's a tricky coure because the second half has way more elevation that the first. Results not online yet, but I like the sound of that one - check out the route!